Fulham‘s incredible run has definitely been merited, as they’ve been looking increasingly dangerous for a while and now even outrank champions-elect Wolves, who look to be coasting over the finish line somewhat. Derby are far from a bad side but are limping rather than striding towards a play-off place, while Bristol City are running out of time to secure a top six spot after a concerning decline in recent months. Fulham have now leapfrogged Cardiff in the automatic promotion race, but it’s far from over. There’s a similar story in the play-offs where Millwall are now narrowly favoured over Middlesbrough to complete the top six. 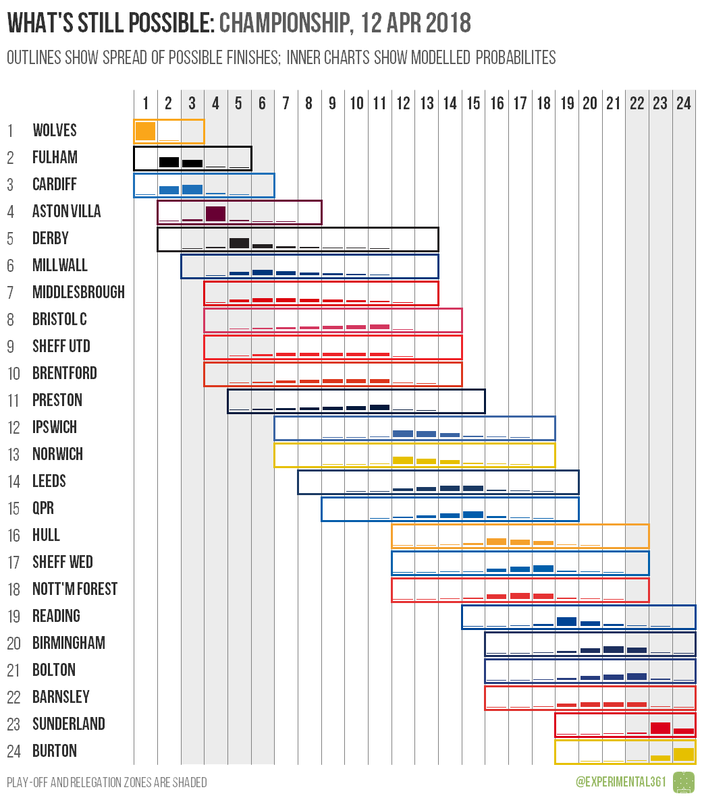 The relegation battle is getting really interesting: while Burton and Sunderland are still very likely to drop into League 1, three clubs are scrabbling to avoid going down with them (four if you count the slim probability of Reading getting sucked back into it). 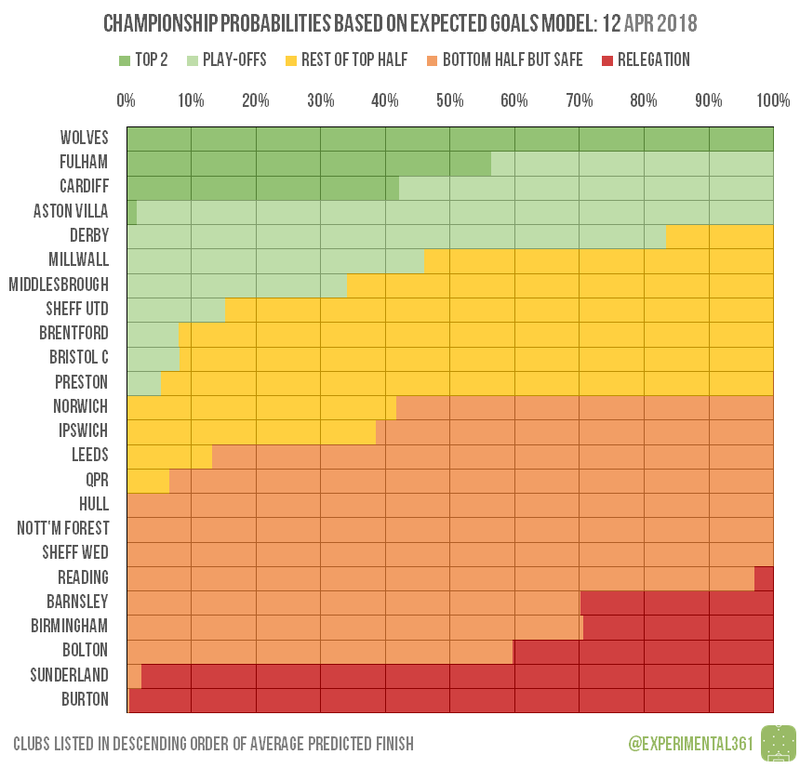 It’s not mathematically guaranteed that Wolves will win automatic promotion, but it’d take quite an unlikely combination of results to deny them. 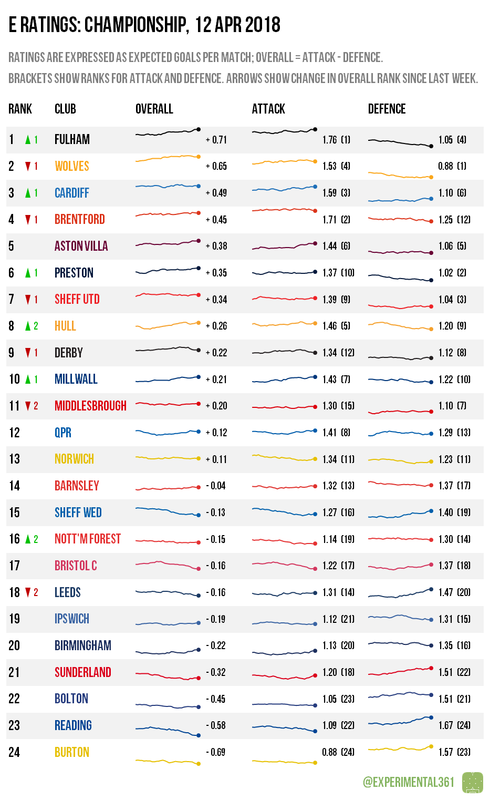 Everyone down as far as Preston can still make the play-offs, with the 7-point gap that’s opened up between them and Ipswich is clearly visible as a series of little cliff edges that meet between 11th and 12th on the inner charts. The Tractor Boys are one of four teams whose seasons are technically “over” in the sense that they can no longer be promoted or relegated. The nine teams from Hull downwards all have the latter threat still hanging over them, with six still able to finish bottom of the pile.